The drive up was wet, and as the ferries were busy, we didn't arrive in Tobermory until early evening. After settling in, we made our way down into the town and straight into the Mishnish pub, where we had a good meal and a couple of pints. Amusingly, the walk down the steep slope had convinced Dad (who is still recovering from cancer treatments) that he'd never make the return trip, so we grabbed a taxi up the hill again after - something that became a regular thing for the week! Our first full day was blessed with sunshine, and I was keen for Rob (who had never been to Mull before) to see as much as possible while the weather was fine. Unsurprisingly he was blown away by the beauty of the isle, the variety of vistas, the peace and tranquility of it all, and of course the wildlife. 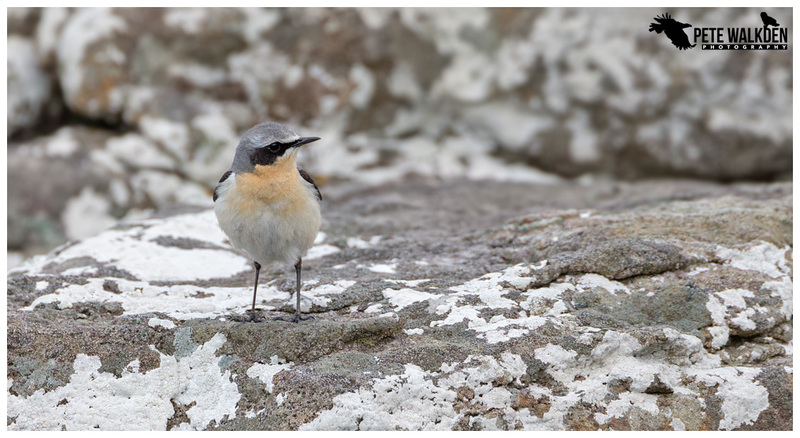 That first day yielded views of two golden eagles, six white-tailed eagles, loads of divers, wheatears, waders and an otter. Not a bad introduction to Mull! 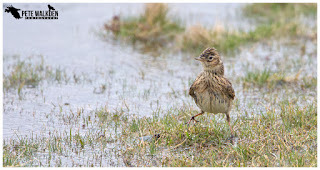 As is typical with Mull, the next day was a polar opposite in terms of the weather, and neither Rob nor Dad fancied going out in the monsoon-like weather. Rob enjoyed a liquid lunch, and I was left to my own devices in the rain. I did on several occasions, when failing to see much of anything, consider if perhaps I should have joined Rob instead! 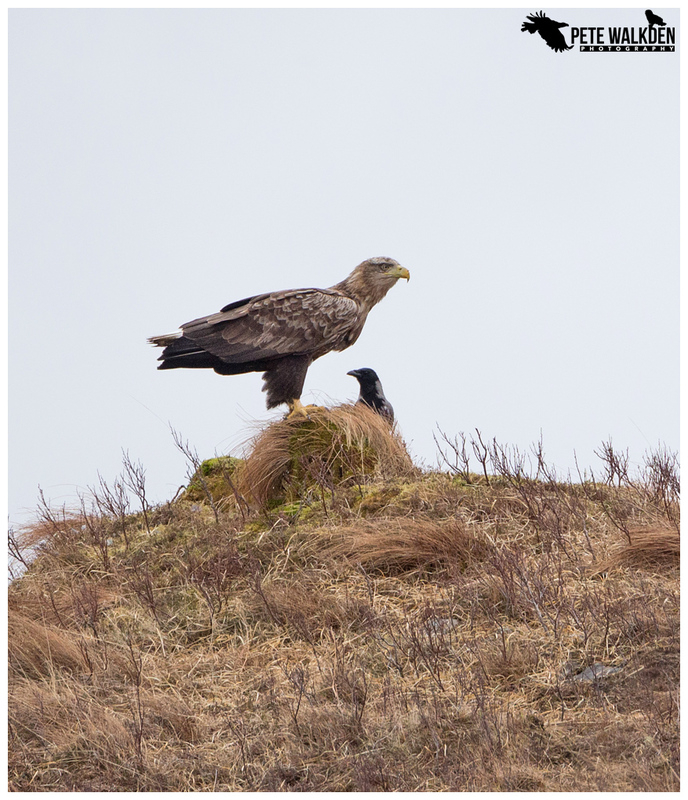 It wasn't a total write-off though, as I saw another golden eagle battling the vile conditions, and giggled at some of the sun-loving birds looking somewhat unhappy with the spring weather. 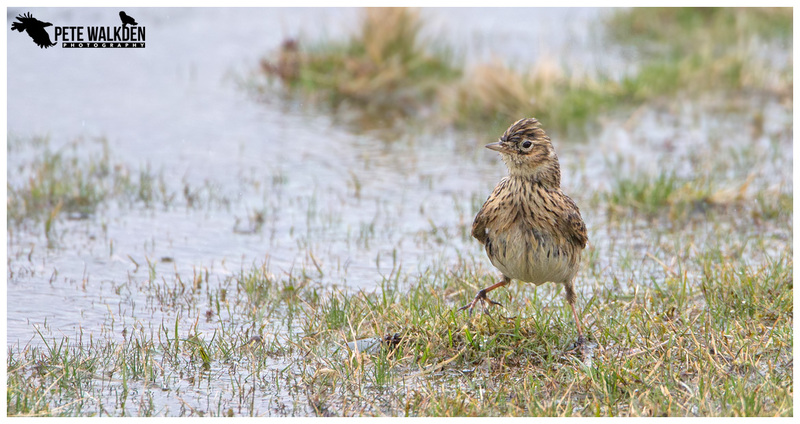 A group of skylarks were making the most of what the water cascading down from the hills, forced out of hiding, and were picking off insects from the grass near the loch's shore. 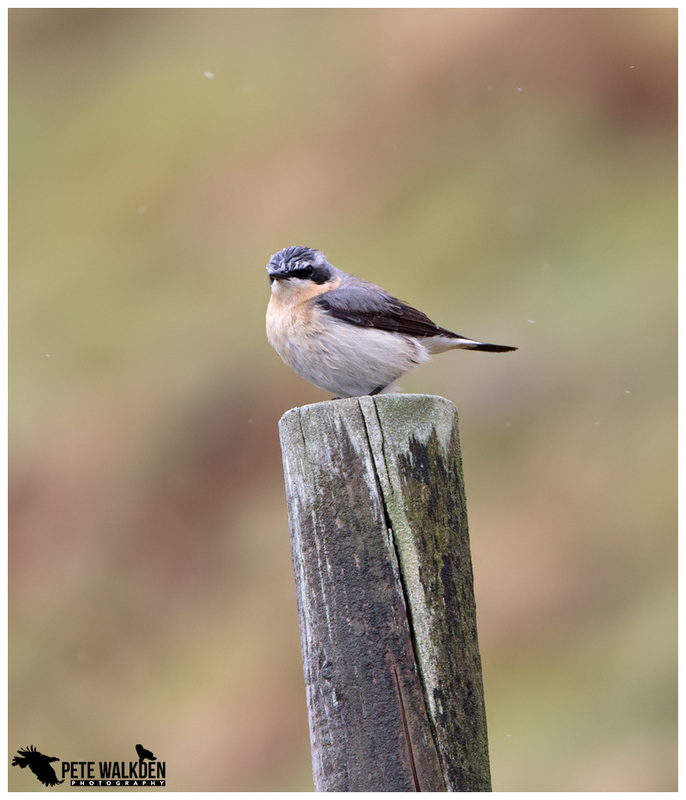 An overcast day followed, and I had said to Rob that this sort of weather tended to lead to better sightings of wildlife, at least in my experience. And after he'd mentioned that he really wanted to see a white-tailed eagle a bit closer up, one obliged as we drove through the glens. Rob spotted it, and after we parked up, the eagle kindly flew right over the car! Certainly didn't need powerful binoculars to see it, though the downside of having dogs in the car meant my camera was in the boot, and I didn't have enough time to get it before the huge raptor had gone overhead. 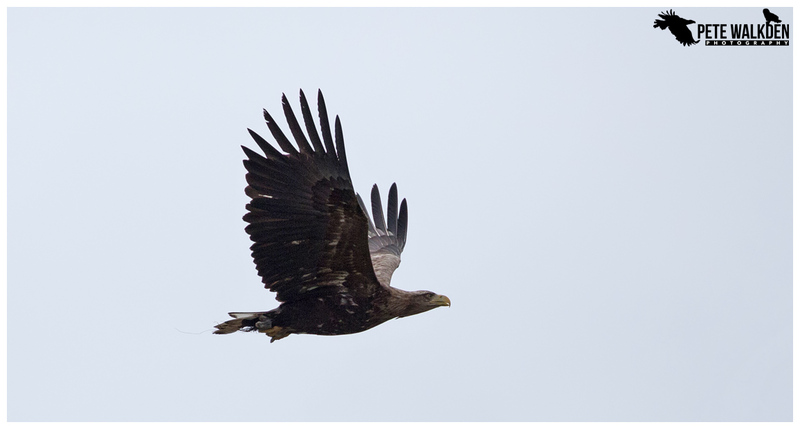 More eagle sightings continued throughout the day, with both white-tailed and golden eagles showing well. Then, late afternoon we spotted a couple of tour buses watching something in the water of a loch. 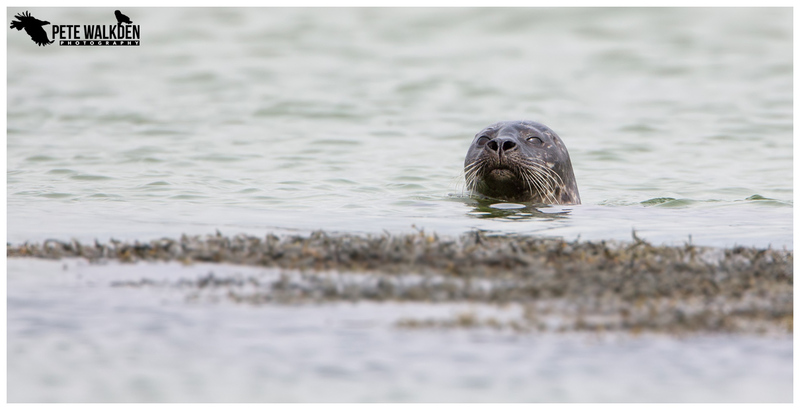 Parking up some way off, I scanned the water and soon realised they were watching an otter. I said to Rob and Dad that there was a good chance that the otter might come our way if it saw all the folks from the tours, though it didn't seem to mind and came ashore not far from them! I decided to climb down on to the rocks to hide and wait. As the tours continued on their way, the otter returned to the loch and promptly brought ashore a large crab, right next to where I was hiding! 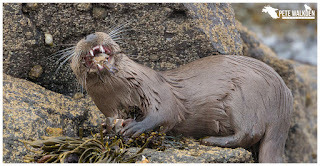 Thankfully both Dad and Rob could see the otter from the car, and we watched as it munched through the crab, before going back out for another, which it brought ashore to the same spot again to eat. Fantastic, and so close I could hear the shell being crunched through. 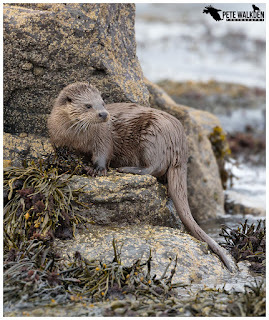 When the otter brought another crab out, I moved further along the shore, and crouched down to watch. Presumably full from all the crab meals, the otter then spent about half an hour grooming on the seaweed, providing us all with amazing views. Eventually, when it curled up into a ball to sleep, I carefully crept away to leave it be. 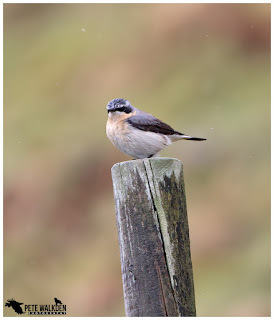 A fantastic day, and one that confirmed my statement about the weather and seeing wildlife! One of Rob's dogs is knocking on a bit and has trouble walking on rough surfaces, so he was keen for them to perhaps visit a beach. I suggested Calgary, and when he wandered off with his happy hounds, I went for a walk along the path that runs alongside the water. I had spotted it from the shore, and was keen to get a bit closer... a great northern diver, and it was almost showing breeding plumage. Needless to say, with their keen eyesight, it soon moved away from the shore when I crept towards it, and I could only watch as it dived for small crustaceans from the sea bed. Being based in Tobermory meant we generally explored the northern side of the isle, so on the penultimate day, I suggested we travel right down to the other end, to at least see Iona, and let the dogs run about on the beaches. Several common seals were playing in the shallow waters beside the beach, so I set up to watch them in some rocks, and was beginning to get some images when I noticed Iona had vanished behind a wall of cloud, and I got soaked as I made my way back to the car! Despite seeing a white-tailed eagle fly over the cottage garden one afternoon, Rob wanted to see them closer still, and when Martin (Mull Charters) confirmed he had space on his boat trip during the first week of tours of the season, we jumped at the chance to go along. Dad stayed behind as he didn't fancy the cooler weather for the trip, and that helped as he looked after the dogs at the same time. 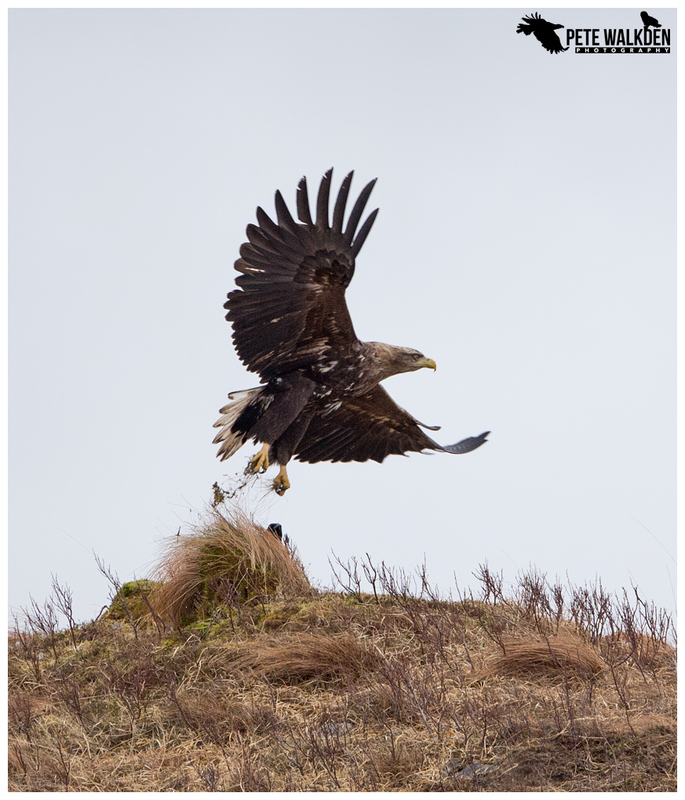 Sailing down into Loch Na Keal, we were soon watching one of the resident eagles approaching. Alex warned us that this individual, the male of the pair, was very proficient at taking the fish, and he wasn't wrong. No messing, just fly over, dive down, take the fish and off again! We were all enjoying a chat during the drinks break when the male eagle returned, and as before, took the fish thrown out in a matter of seconds. I never tire of seeing this, and judging by Rob's comments and smile, he was suitably impressed with the show too. After a good natter with both Alex and Martin, we left the Lady Jayne, headed back to base to collect Dad and the hounds, and spent the last few hours scanning the area for wildlife. A drive along Glen Aros yielded good views of a golden eagle, and as ever, masses of buzzards, and a tour of Loch Na Keal gave me another attempt at photographing a great northern diver, though this one was less advanced in terms of plumage, and the conditions were so grey when I saw it, the images could just as well be in black and white! 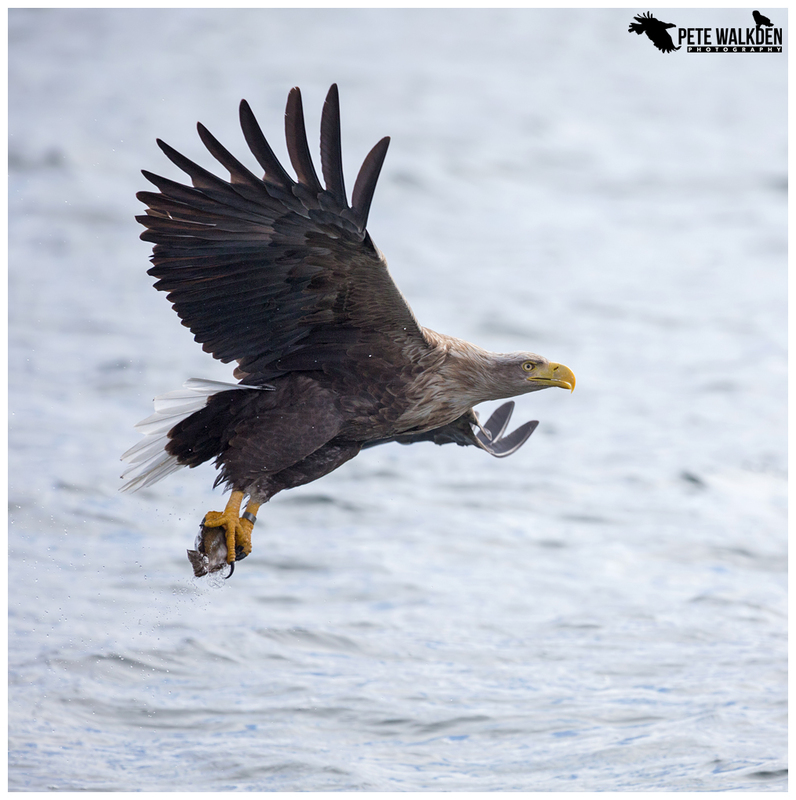 While the boat trip for the white-tailed eagles undoubtably provides about the best opportunities for images of these magnificent birds one could ever hope for, seeing them hunting in the wild is something else. Some years ago I was fortunate to watch a pair hunt and take a grey heron, and have seen numerous attempts to catch prey since. The white-tailed eagle caught our attention as it circled fairly high up over the hills beside the loch. As we considered driving closer, it went from a slow glide into a steep and very rapid dive, hurtling down towards the hillside, and at the last second angling back towards the roadside, where it swooped down on to something in the vegetation. Incredible to see, and as it took off, it started to fly towards us. I jumped out and grabbed some shots as the eagle flew around us and up towards the hillside once more. Driving down towards where it'd taken the prey, another observer informed us that he could see it on the hillside perched up, and that "if we had a big lens" we might have a chance of a shot. 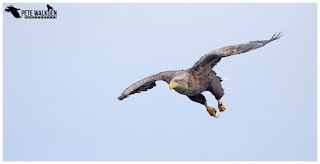 Whoever that was I owe you a drink, as we were soon scrambling up some slippery rocks and over a marshy mound to look across at the eagle as it fed. It's only when you see one perched next to another large bird like a hooded crow that you realise just how massive they really are. And as we watched on, it made light work of the prey, ripping it to pieces and wolfing them down. A quick look around for any scraps, and the eagle took off again, and was within just a few moments, almost a mile away down the loch! Awesome birds. Rob and I climbed the slope to where the eagle had been eating to work out what prey it had taken, and judging by the bits of fur, it had been a rabbit. Which figures, as there are quite a few of them along that stretch of the hillside. What an amazing end to a week of exploring Mull, and something we will all treasure in our memories. Though the week had also provided me with some great evenings spent in Tobermory, with fantastic meals in the Cafe Fish, Macgochans, Spice of Mull and Crystal Palace restaurants. Cafe Fish was exceptional though, and despite being so early in the season, we had to book a table. The Mishnish pub was where we ended most nights, and had a good atmosphere, decent beer and was always welcoming. I'm certainly missing the view from the window looking across Tobermory harbour. And as usual I'm already missing being on Mull. My next visit is during the summer for the first of four weeks of tours there this year, and I can't wait. 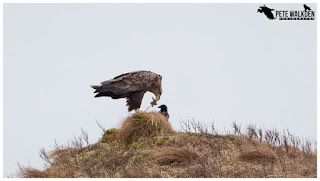 I have one day on mull next month. How do I cram all that into a day? Great otter pics.